Plate 38 from 'Picturesque Scenery in the Kingdom of Mysore' by James Hunter (d.1792). This aquatint is based on a pictue by Hunter depicting the hill fort at Hutridurga, Karnataka. It is part of a range of hills that runs through Tumkur District, in the former kingdom of Mysore, near to Bangalore. This fortress was of strategic importance during the Anglo-Mysore Wars of the late 18th Century when the British fought against the Rajas of Mysore Haidar Ali (c.1722 - 1782) and his eldest son, Tipu Sultan (1753 -1799). 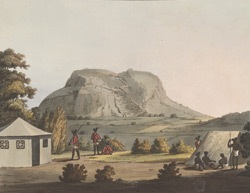 The fort was small but situated on an inaccessible rock. It was taken by British forces in June 1791and was especially convenient as the area was well stocked with cattle, sheep and grain which supplied the army.